We are all blessed to live in great abundance. Our abundance has been given to us not so we can get more stuff, eat more food or live a more comfortable life. It’s give to us so we can meet the needs of others, both those we know personally and those we do not. The people of Haiti are suffering and each of us has the opportunity to give out of our great abundance. Here’s my challenge to each Frugal Living NW reader — Most importantly, pray. Next, figure out what you can sacrifice in the next week and give that amount to a relief organization of your choice. Go without coffee, a date night, buying groceries (Eat From the Pantry Challenge, anyone?). Take what you save and donate it. :: Leave a comment with what you and your family will sacrifice this week to help the people of Haiti. For every comment left between now and January 21, my family will donate $.25 to Samaritan’s Purse. 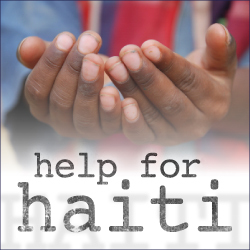 :: If you have a blog, post about what you and your family will sacrifice this week to help the people of Haiti. Encourage your readers to respond to the disaster too. After you post, leave a link on the Mr. Linky below. For every link left between now and January 21, my family will donate $.50 to Samaritan’s Purse. Samaritan’s Purse is a Christian organization committed to providing spiritual and physical aid to hurting people around the world. Samaritan’s Purse is in Haiti now working with local hospitals and missionaries to provide clean water, temporary shelter, hygiene equipment and medical supplies. Just a quick note about donating: scams abound after disaster strikes. Please be mindful about who is getting your money. I suggest finding an organization that was established well before the earthquake hit with a strong reputation and a presence in Haiti so they can get your donation to the people as quickly as possible. In addition to Samaritan’s Purse, Compassion International, World Vision, UNICEF, The Salvation Army and The American Red Cross are some that fit these guidelines. I would like to acknowledge and thank Crystal at Money Saving Mom for facilitating this effort. Please stop by and check out what other bloggers are doing to help the people of Haiti. I am donating crackers, feminine products, toiletries, peanut butter, etc. from my pantry's stockpile. It's not much, but I am SO HAPPY to do it! I am donating my 2 $5. rebate checks from Johnson and Johnson. God bless you all for what you are doing! I just thought you might like to know some details about Haiti. My mom has been planning a trip for the last year with a team of nurses to take medical supplies and help the children at an orphaige in Haiti. The were schedueled to leave thursday the 22nd. due to the closure of the airport in Port au Prince, they have had to post pone. They have been cleared to land on sunday and will be the first flight allowed into Haiti once the airport opens. It is exciting to know that our rescourses and efforts are going directly to the people. What a wonderful thing you are doing. My prayers to go to all those in Haiti. I made purchases through Craft Hope/Etsy(all proceeds go to Haiti) and we are donating money through our church. May their be peace in Haiti. Shop for Valentine's Day and help the people of Haiti. For every Valentine's Dessert Collection I sell between now and Jan. 25th, I will donate $10 (my commission) to the Red Cross for Haiti. We donated to CrossWorld International, a missions organization we have traveled with. I'm giving to the Red Cross and the LDS Church. Thanks for doing this! I donated to Samaritan's Purse and Compassion International. I donated $35 to Doctors Without Borders (who were already there on the ground and worked tirelessly through those first days despite the fact that some of their own were missing and are now likely dead) and also $35 to The Salvation Army, who are excellent stewards of God's money. My husband and I are donating to Compassion. Thank you for your help! I decided to donate to 'Doctors without Borders.' Thanks for all you are doing!! We donated 50 dollars to Redcross. My husband is a Haitian American, and we are devastated by this disaster. I appreicate all you do and keeping people in Haiti in your prayers. We donated to Red Cross and Direct Relief International. We are also planning on donating to other organizations as well. Again, thank you for your help. I had an envelope that I have been filling with left over grocery cash for our trip to Disneyland this summer. I will be giving this money to Samaritan's Purse, and am more than happy to do so. We gave to Red Cross via txt and YeleHaiti via txt. Thanks for your efforts! I donated money through a text message to the Red Cross and I am leaving comments on blogs to help get the word out. I wish I could go there and help! It is heartbreaking! Thank you so much for your efforts and I agree…CHECK out the charity but also bless you all for giving. Talking to DH tonight but will likely go with MercyCorp. We are taking money out of our "entertainment fund" and donating it. The kids are also going to be taking money out of their piggy bank to add to the fund. Due to our financial situation, I am commenting on as many sites as possible to raise donations for the relief effort. Bless you for not only helping but providing a way for everyone to help too! I donated to World Vision today. We donated to the Red Cross. Thanks for stepping up. Thank you for doing this. My husband and I donated through Samaritan's Purse. And now I'm clicking to comment on every site I can…every little bit helps! We will be donating to MercyCorps. Our family is sending up prayers to the One who can do the most!! Our church also took and sent contributions in and we bough tickets on Hope for Haiti. My heart breaks especially for the little ones affected. We truly are blessed and I am thankful that we are able to bless others in return! My family will be donating money to the relief effort. Thanks. I've saved money on groceries this week and we don't need to go out to eat, so we'll donate all the money that we would have spent to help those in Haiti. I also want to encourage people who are considering adoption. When things stabilize, there will be SO many children who need forever families. Holt Intl (the oldest international adoption agency in the world and is based in Oregon) already has an adoption program in Haiti. I'm sure that everything will be on hold for a while, but please, please begin to pray for the orphans in Haiti. Yesterday we donated $200 to Samaritan's Purse to help Haiti. As a single income teacher, this is somewhat significant for us, but since we are Eating out of the Pantry this month, I think we will save close to that amount. We will be donating the cost of 2 of our meals on Sunday (fasting). I am encouraging my children to get involved as well–I was very touched when I read your comment that God gives us abundance, not to hoard, but to share. I am going to use my grocery savings, and cut down my driving so that I can donate my weeks worth of gas money to the Red Cross. That's a start of $65.00! We'll see what else we parents and our kiddos come up with! We donated to Clean Water Haiti- a Christian based charity that our church is affiliated with. Our donation was matched dollar for dollar by my employer– which is very much a blessing as well. Thanks for all you do for so many on this wonderful blog. We donated to the US fund for UNICEF and also to a local (Kentucky)-based charity called Ten Kids whose goal is to provide a safe home, education, etc. to Ten Kids http://www.tenkids.org/. I like the idea of giving to an organization meeting general needs of the people of Haiti and to one meeting the needs of specific children. We are so blessed–I can't imagine the losses of the Haitian people. We donated to the American Red Cross this morning. Thanks for using your blog to help convince people to donate. Part of our budget is earmarked for times like this. Our family gave to World Vision. I spent some time in Haiti on a mission trip almost 20 years ago. The people of Haiti are so incredible and taught me so much about joy and love in the midst of tough circumstances….Thank you for doing this. Thanks for doing this. Make sure you tell people to go to approved lists to find places to donate and don't get scammed! It's sad, but it's a huge reality that people are trying to capitalize on this. We donated through Crisis Response International (CRI). They sent a team down yesterday to assist with search and rescue. Thanks for doing this! Samaritans Purse is a GREAT organization! I also wanted to mention for those of your worried about supply distribution that World Vision is another Christian Organization accepting releif donations. They have close to 400 employees already on the ground in Haiti (they have been working in Haiti for over 30 years now). World Concern one more option. Hope that helps. It is an important effort.